While at Baptist Bible College it was common to have conversations with a friend about some gal that had captured their heart and now they were considering asker her to marry them. My standard reply was to imagine falling into a dark bottomless pit and all the way down you could see the words flashing in neon “Forever and Ever and Ever” It was a not so subtle reference to the bottomless pit that Satan will be cast into one day. There would be an occasional chuckle, or nervous laugh, but the truth was in our minds that marriage was a serious undertaking that impacted the rest of your life. In 1870 a wife would be lucky if her husband lived past the time the youngest child left home. In 1911 the average marriage lasted 28 years. By 1967 that average had reached 42 years. Paul Harvey got to the point that he wouldn’t even mention your anniversary unless it was 60 and most of the time 70 years of marriage. Now 70 years of marriage would seem like an eternity to most folks. But with medical care advancing, if a couple stays together, it is no big deal anymore to see at least their 50th anniversary. 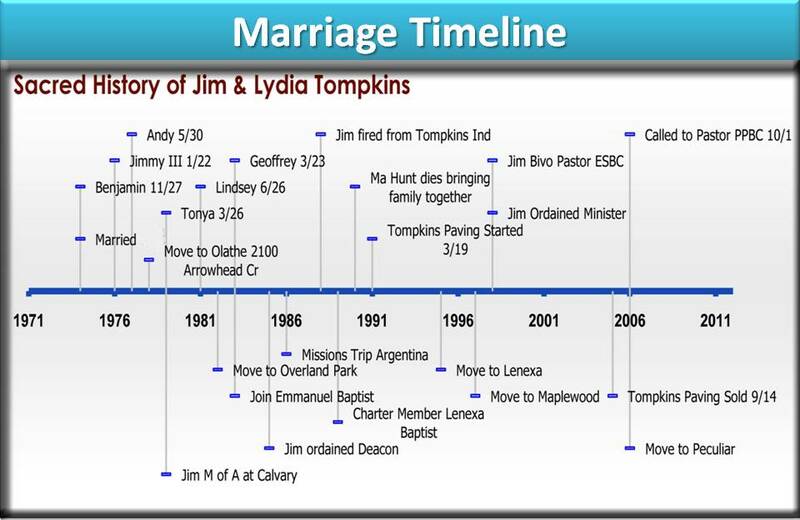 We have at least three folks in our church that have been married over 60 years. What this means is that you have an opportunity to build a real history with each other. Now with digital cameras, you might be able to remember it all. With our American brains we see time as a line with various dates and events marked on it. It is a linear view of history. Time is the determiner of when things happen. We got married on a certain day. 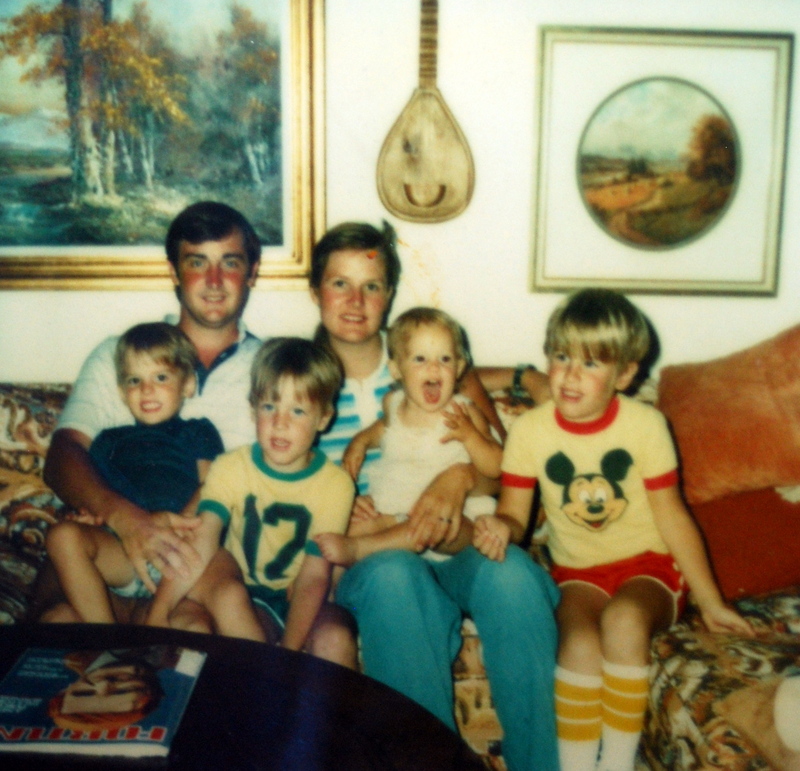 We had children on such and such a date, we bought this house on a certain date, we sold and bought another house, etc. The kids went to this school at such and such a date, graduated from High School, College etc. Everything fits on the timeline of our life. 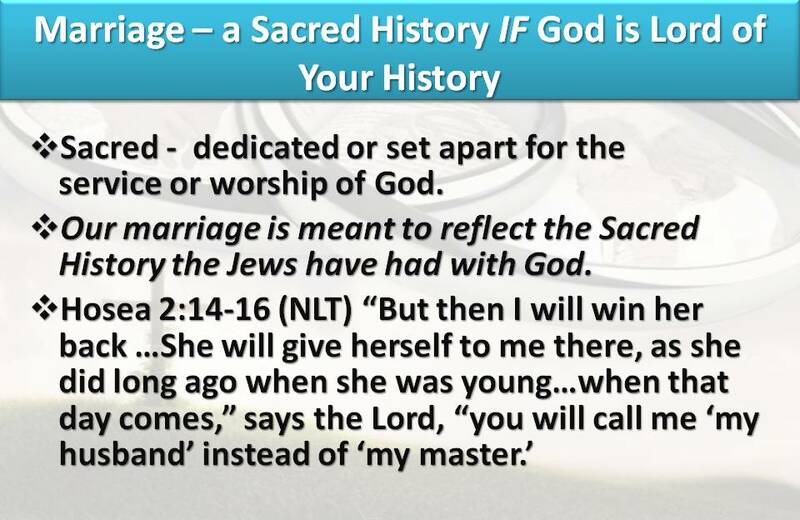 To understand how marriages have the opportunity to enjoy “Sacred History” it would be helpful to understand a Biblical view of History. This is where an understanding of ancient Jewish view of History comes into play. The ancient Hebrew perception of time was not abstract like our modern view; instead, it was connected to the idea of specific events, and because of this event specific orientation the people of Israel “found the idea of a time without a particular event quite inconceivable” [Von Rad, v. 2, page 100]. 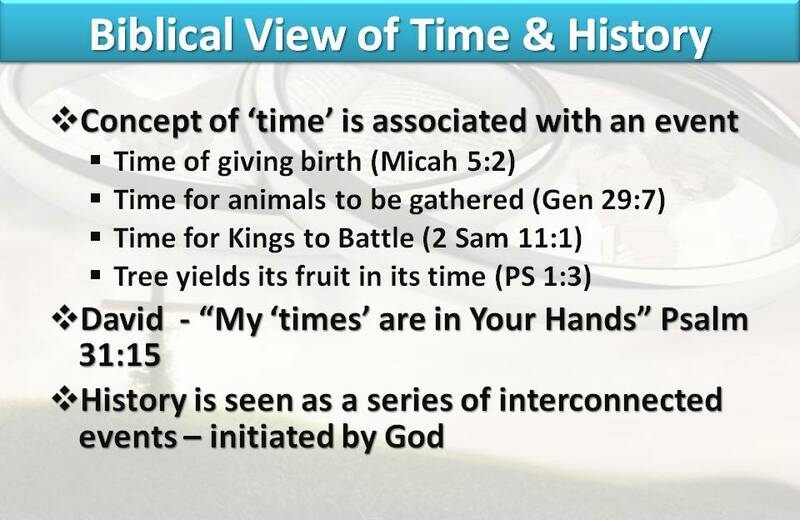 So, for the ancient Jews the concept of “time” was understood only in relation to particular events: There is a time of giving birth (Mic. 5:2), a time for animals to be gathered together (Gen. 29:7), a time when kings go forth to battle (II Sam. 11:1). The tree yields its fruit ‘in its time’ (Ps. 1:3), and God gives his creatures food ‘in due time’ (Ps. 104: 27); that is to say, every event has its definite place in the time-order; the event is inconceivable without its time… [Von Rad, v. 2, page 100]. Psalm 31:15 which reads, “My times are in thy hands” [KJV,RSV]. The Jews of David’s time did not think of time like we do, they viewed life as being made of many times, or a series of times. 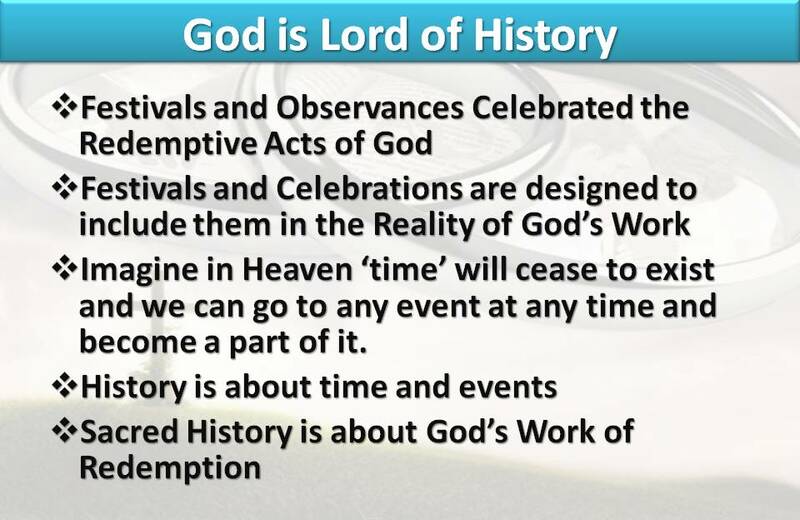 Specifically, the Jews saw time as a series of specific events initiated by God. Time did not exist as an independent reality, but existed only in relation to divinely initiated events. I will use my wife to illustrate how the Jews viewed history. My wife views our history not by dates but by whom she was pregnant with at the time. I’ll mention a particular event and say when did that happen and she’ll say – well it had to be so and so year because she was pregnant with Tonya or somebody else. If it happened when she wasn’t pregnant with any one, she can’t remember it or can’t recall the year. Her concept of time is totally event related. All of their festivals and observances celebrated a Redemptive Act of God. The exact time was not important, but their celebration and identifying with what God did was important. I believe in heaven that time will cease to exist. We will simply live in events in happenings. We’ll be able to participate in the crossing of the Red Sea. We’ll be able to watch as Jesus feeds the multiture. We’ll watch as Peter walks and then falls into the Sea. We’ll watch as Jesus rescue him. It won’t be a movie, it will be the real thing. Time will cease to exist, and we will be totally event oriented. It will be totally about seeing how God has redeemed us and mde us trophies of His grace. Karl Barth (a famous theologian) was challenged by an atheist to prove the existence of God. His reply was quite simple – the Jew. For over 4000 years the Jews have kept a separate identity while all the other races of man came and went. Yet the Jewish people with their worship of Yahweh has continued on in spite of losing their land, being persecuted in countless ways down through the centuries. 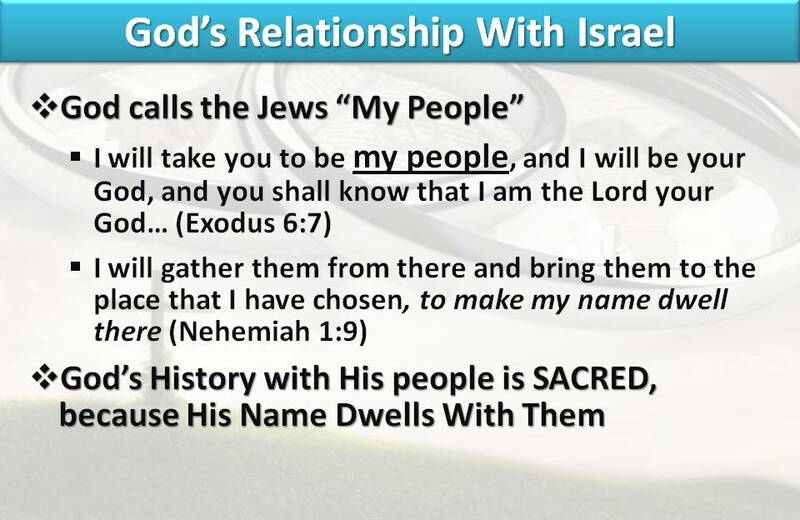 Still, the Jews continue on, worshiping and following the same Yahweh that revealed himself to Abraham, Isaac and Jacob. Exodus 6:7 (ESV) I will take you to be my people, and I will be your God, and you shall know that I am the Lord your God, who has brought you out from under the burdens of the Egyptians. God calls them “My People” because He shows His redemptive Power and Love to the entire world through His relationship with them. The good, the bad, the ugly shows to all the world that there is a God who has the power to save you if you come to Him. Marriage: A long journey that two people take—and a sacred one. Sacred – dedicated or set apart for the service or worship of God. Marriage is the journey of two stumbling sinners falling toward God and each other and all the while experiencing events and experiences that can demonstrate the redemption of God to a lost and dying world. You simply have to see God as Lord of your History. You dedicate your TIMES to show forth God to a dying world! We all have a history of ‘times’ with our spouse. There were moments of labor and delivery, struggles to conceive, financial pressures, financial success, problems failures, struggles, joy. 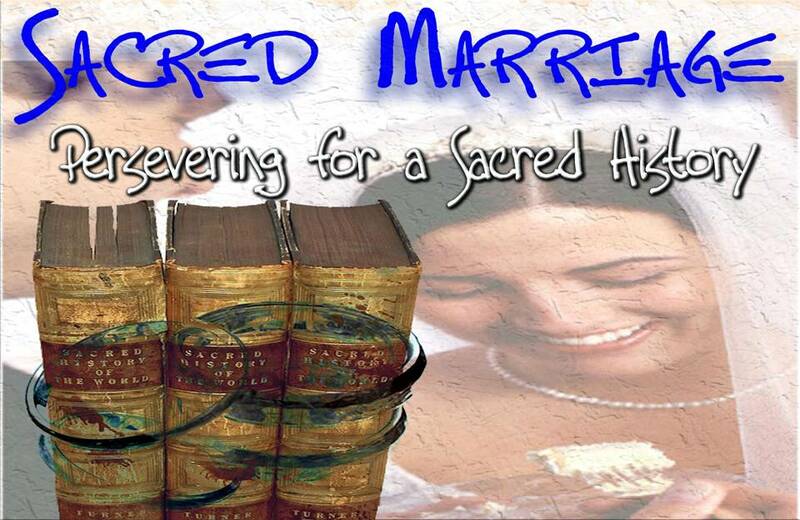 What makes that History Sacred is whether or not we see God as Lord of our History, and devote our marriages exclusively to show the steadfast and persevering love of our Heavenly Father. The events of your life, good and bad, become a testimony to God’s working in your marriage. With God the exact dates are not important, but the fact that you acknowledge Him as the Lord of your Marrige History is! Think to the darkest moment of your marriage – God was there. Think of the greatest moment of your marriage – God was there. Every high and every low demonstrates the redemptive Love of God. Our marriage is meant to reflect the Sacred History the Jews have had with God. God called a young man and told him to marry a prostitute. So Hosea went and found Gomer. It wasn’t long before she left him to return to her lovers. Marriage is not always good, not always bad – sometimes it just is. Marriage must become good with living with routines. To have a good marriage takes time. Working through problems, enjoying special occasions, coming together in times of setbacks. You must decide to see God in the routine of your marriage just as much as you do in the mountain top experiences. The same thing that will keep your marriage together through “sickness and health, for richer, for poorer, for better, for worse, in sadness and in joy, is the same thing that will keep you growing as Believer in Jesus Christ. It is a little thing we call perseverance. 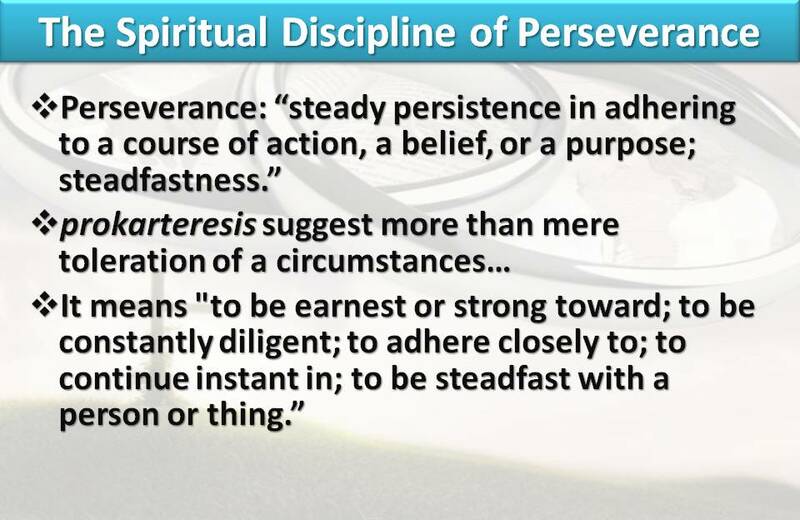 Perseverance is “steady persistence in adhering to a course of action, a belief, or a purpose; steadfastness.” Perseverance is different from endurance. Endurance can indicate “putting up with,” “bearing up under,” or merely “tolerating” a demanding circumstance, implying a definite passive quality. Perseverance or prokarteresis suggest more than mere toleration of a circumstance because they have definite proactive characteristics. It means “to be earnest or strong toward; to be constantly diligent; to adhere closely to; to continue instant in; to be steadfast with a person or thing.” The Greek verb proskartereo (Strong’s #4342) is most frequently translated into English as “continue in.” Its closest English synonym is “persistent.” Both contain a strong sense of continuous persistence toward achieving some activity. A young lady named Marti finally got married. Before marriage she brough all this luggage of failed dating relationships and failed family relationships. After the first year of marriage Marti and her husband were experiencing some hard times, complete with the fights and frustrations that often accompany adversity in a marriage. After one bad fight, Marti prepared herself for what she thought was inevitable: her husband would leave her, just like all the others before. Her husband was a Christian fimly committed to the idea of Covenant Marriage. While she was sulking in the other room, he came into her ans said these simple words: “I will never leave you.” I will stay with you and we will work through this problem. James 1:2-4 (HCSB)Consider it a great joy, my brothers, whenever you experience various trials, knowing that the testing of your faith produces endurance. But endurance must do its complete work, so that you may be mature and complete, lacking nothing. James 1:2-4 (NIV) Consider it pure joy, my brothers, whenever you face trials of many kinds, because you know that the testing of your faith develops perseverance. Perseverance must finish its work so that you may be mature and complete, not lacking anything. 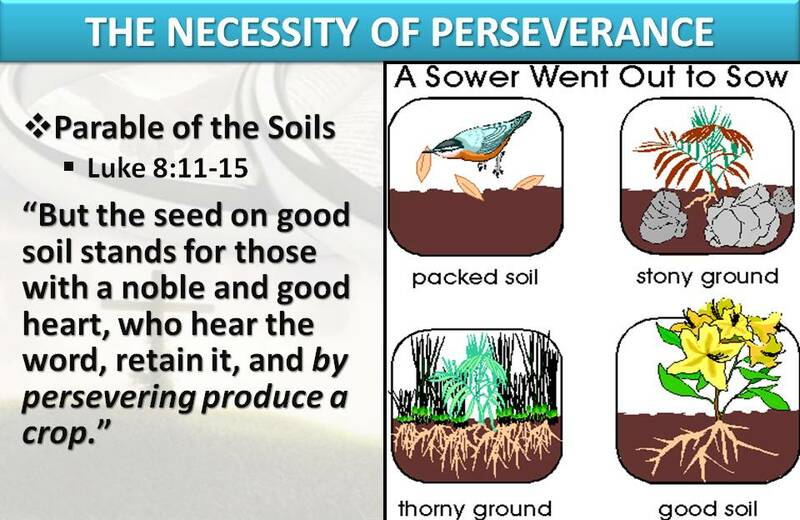 Our maturity with God is directly related to our perseverance, the way we stay active and seeking Him, even though we can’t see Him through the tears. Too many people quit God, quit the Church because of some little hurt, or because the feelings are not their. Faith in God is not about Feelings. Enjoying your Sacred History together will involve time when the feeling just aren’t there. 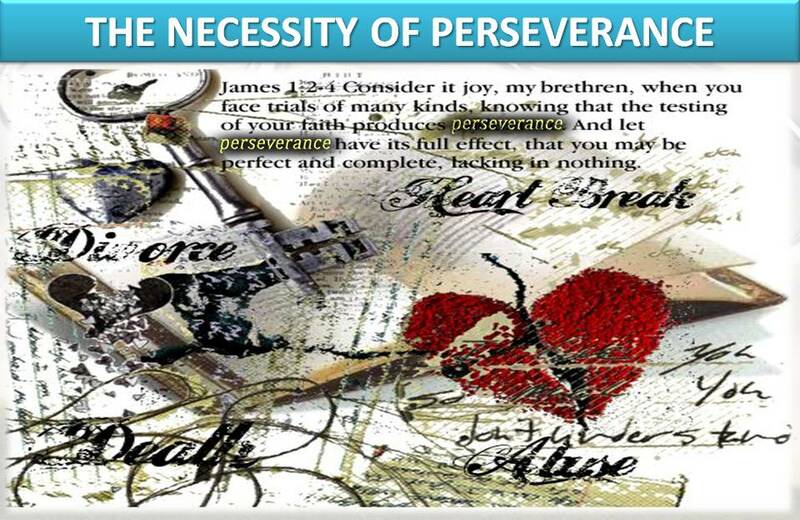 Perseverance through trials and difficulties creates beauty and meaning for your life. God will grant you glory and honor. If you are self-seeking in your marriage, and reject the truth of God’s Word, you will gain God’s wrath and anger. Pulpits across America must stop excusing the Truth of God’s Word! We must preach the truth and the truth is that God hates divorce. I believe the wrath of God may be upon America not necessarily because we have taken God out of the schools. God didn’t call the schools of America to preach the truth. God called His preachers and pastors and church leaders to proclaim His truth. He calls every Christian couple to be witnesses of the Gospel. That witness is the Love and Forgiveness of Jesus Christ as shown in a Marriage that is Life Long, because God’s Love is Life Long! Preachers have stopped preaching the truth that God Hates Divorce. We excuse it, we tolerate it, we find more and more ways to make it OK. We’ve even have Divorced Pastors leading churches. If there is any wrath upon America it is because the church has become self-seeking and has rejected the truth of God’s Word. Persistence makes no sense unless we have a keen sense of eternity. 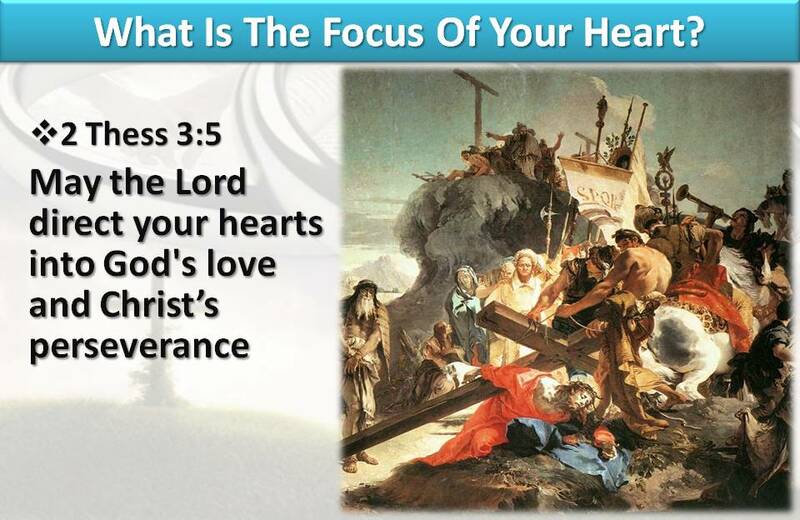 What is the focus of your heart? Is your focus on living a life that is preparation for Eternity? Perhaps God is using your difficult marriage to prepare you for your Eternity! So you have had a rough couple of years, even decades, what is that when compared with how you will spend ETERNITY? The Bible doesn’t mention rewards for those Christians who are the happiest of have felt the least pain or experienced the least sorrow! 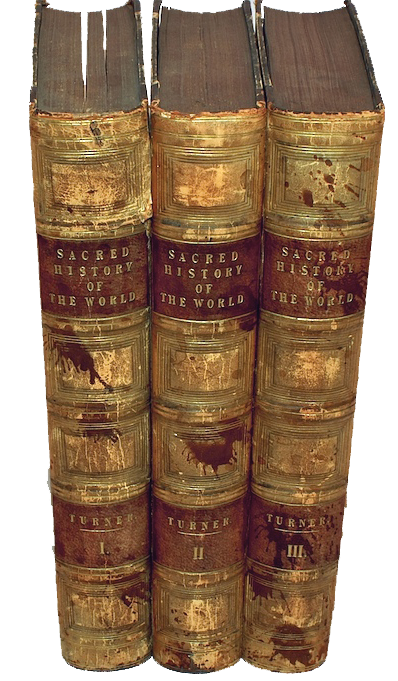 Priority of Sacred History is Eternal Priority. 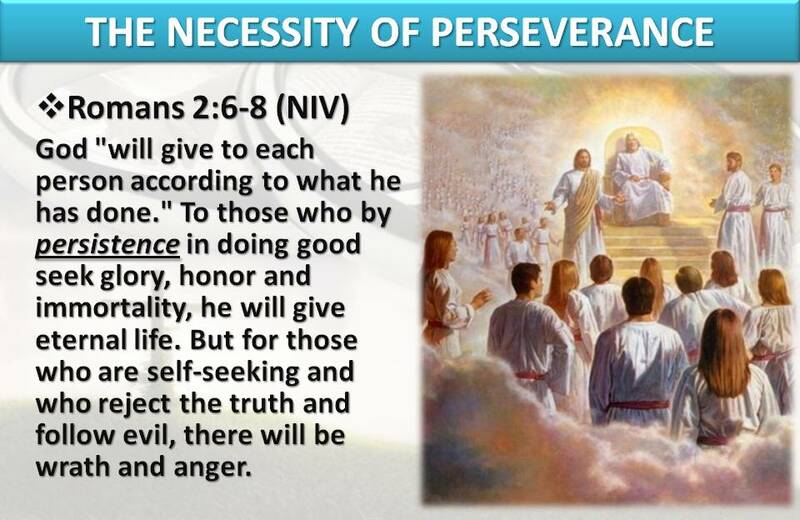 2 Thess 3:5 May the Lord direct your hearts into God’s love and Christs perseverance. Sacred History means being persistent in doing good! Marriage goes through many seasons. Sometimes you simply have to get through it. This is merely a season, and it is foolish to quit perservering during a time when any marriage would have to adapt. If there is no heaven, divorce makes sense. But if there is heaven and God and Judgment, does the cost of divorce (God’s wrath and anger) justify the jeopardizing your future? Divorce is a failure of love, forgiveness, patience and at the very least a failure in judgment in choosing a difficult partner in the first place. But we must realize we are all failures at some point. 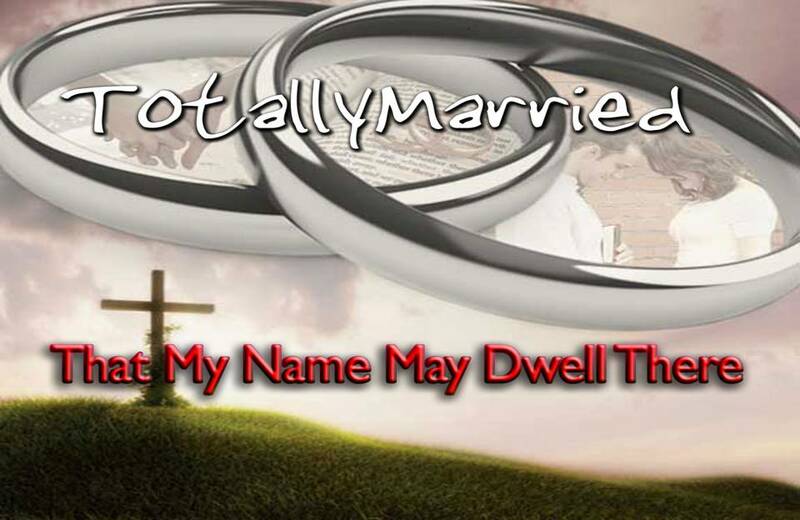 According to Matthew 5:28, I and virtually every other man must be considered an adulterer. One lustfull look and Boom! we have fallen. One angry outburst “You Fool!” and I’m in danger of hell fire. (Matt 5:22). While Jesus is certainly a picture of God’s Holiness and High standards, He is also a picture of Mercy and Forgiveness. He told his disciples that if anyone puts their hand to the plow and then turns back, is not worth of the Kingdom of God (Luke 9:62). If you have gone through the pain and heartache of divorce, you serve no one other than the devil by fixating on something that can not be undone. The Scriptures says humble yourself in the sight of God and He will lift you up. The is no exception clause for God grace against divorced people. If you are in a difficult marriage, I exhort you as Jesus would to hang in there. Do more than hang, do all you can to follow Jesus commands for relationships. Most of those are contained in his sermon on the Mount in Matthew 5, 6, 7. Divorce is not the same as denying Jesus or leaving your faith, but it is a dangerous decision spiritually. However, Even God’s word has allowed that there may be conditions in which it is a right choice. Matthew 19:9 records the exception for infidelity. 1 Corinthians 7:15 reveals the situation when an unbelieving spouse abandons a believer. To evaluate your marriage at that point is foolish and short-sighted. By quitting or looking elsewhere you will block God from the Sacred History of Redemption that He is building in your marriage. When we leave someone, don’t pretend there won’t be spiritual consequences. God is angry when we abuse his children. In these “muddied” versions of Psalm 2. I have changed the nations and Kings to read Husbands and Wives. Instead of seeking your own way, God warns us to submit to God’s royal Son (or kiss the Son in KJV) lest He becomes angry. Our persevering in our marriage is SO important to God! Psalms 2:1-3 (NLT) Why are you husbands and wives so angry? Why do you waste your time with selfish plans? You prepare for battle; you plot together against the Lord and against his anointed one. “Let us break their chains,” you cry, “and free ourselves from slavery to God.” But the one who rules in heaven laughs. The Lord scoffs at you. Then in anger he rebukes you, terrifying you with his fierce fury. Psalms 2:10-12 (NLT) Now then, you husbands, act wisely! Be warned, you wives! Serve the Lord with reverent fear, and rejoice with trembling. Submit to God’s royal Son, or he will become angry, and you will be destroyed in the midst of all your activities— for his anger flares up in an instant. But what joy for all who take refuge in him! 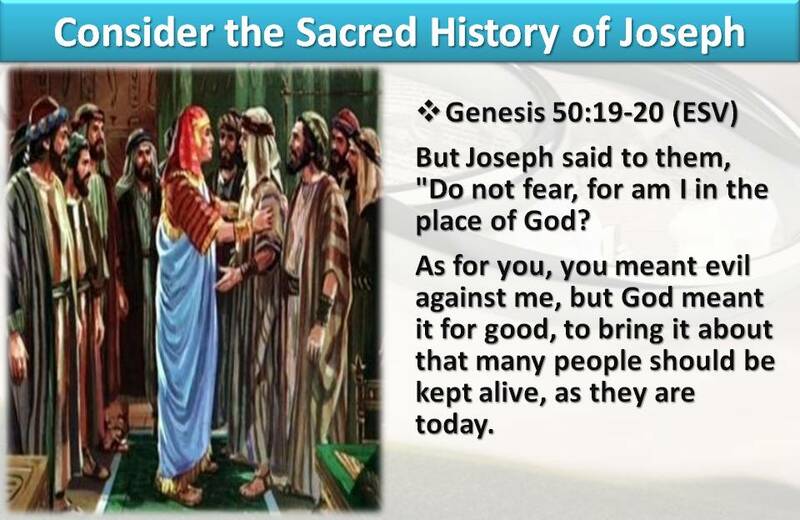 In Genesis 50:20 Joseph tells his brothers that they intended harm to him when they sold him into slavery. He also told them that God was active in all this “in order that” (i.e. to the intended and accomplished end) good might come to him. What if the Spouse Wants Out? We can’t see the consequences of our divorce. 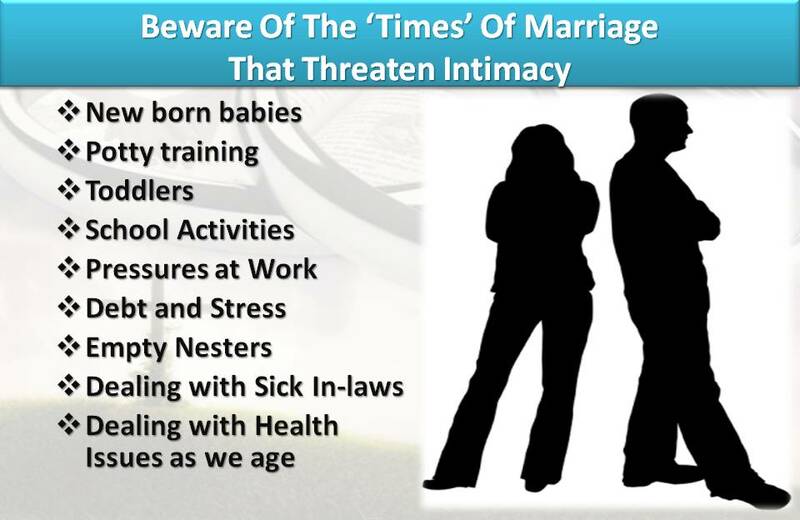 We can’t predict the chaos, the confusion, the hurt and the effect upon our children and their marriages. 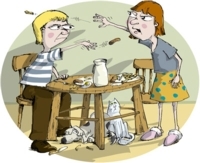 Marriage can produce tensions and hurts so intense that reconciliation would take more energy than either partner could possess in ten lifetimes. In many cases God can provide the energy; in some cases people are just not willing to accept it, or to do what God says is needed to do. Divorce is an easy alternative. Sometimes we have divorced forced upon us. Even so, our maturity before God must be considered and become our driving motivation. Even when we are sinned against, we can grow through the experience by the grace of God. The message of Eternity and Pleasing God and bringing glory to God is this: We draw closer to God by honoring the history of our marriage, even when our spouse leaves and divorces us. God can use this to draw us closer into His heart. 2.Thank God for all the “times”, even those when you thought He forgot you or left you. 3.Ask Him to bring healing to your heart for the “times” when you were hurt or disturbed by what God seemed to allow in your life. 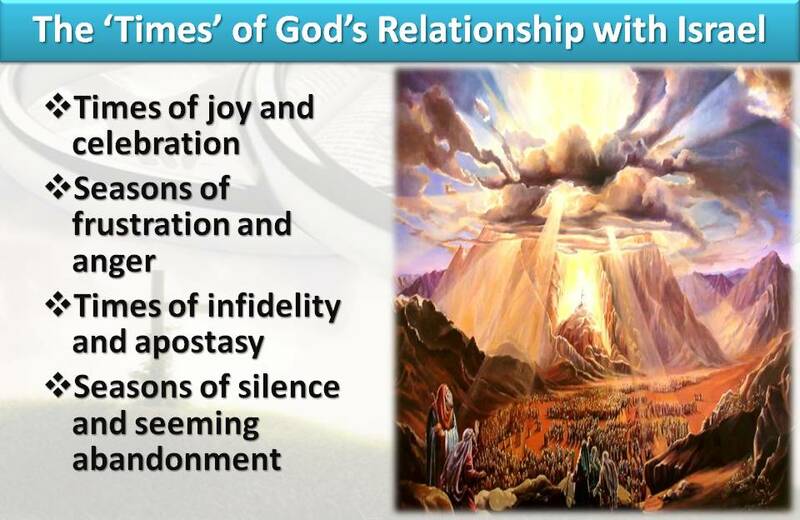 4.Dedicate your remaining ‘times’ to show forth God’s Remptive Love to those around you. 5.Tell your spouse you are committed to building a Sacred History with them for the rest of your life.